345 photographs. 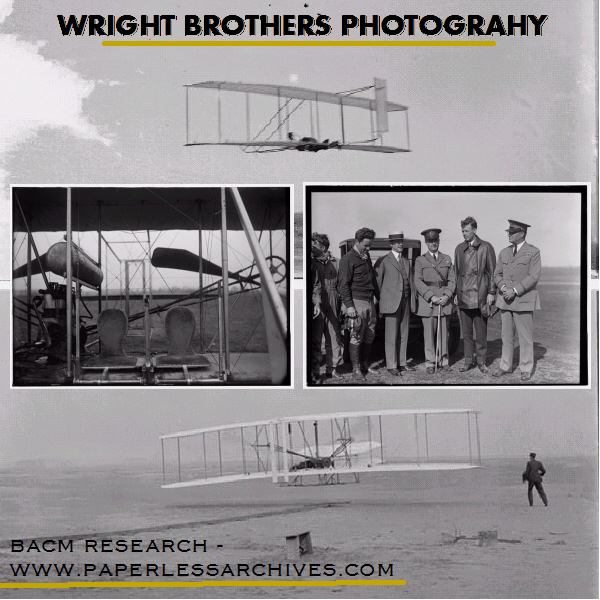 302 photographs, mostly all taken by Wilbur or Orville Wright between 1896 and 1911. 43 photos by Octave Chanute. The first powered flight was made by Orville Wright at Kitty Hawk, N.C., on December 17, 1903, the result of years of experiments and design by the Wright Brothers, who were operators of a bicycle repair shop and factory in Dayton, Ohio. The brothers continued their flying experiments in Ohio and in Fort Myer, Va., and were granted a patent for the plane in 1906. Wilbur died of typhoid fever in 1912 and Orville sold his interest in the Wright airplane company in 1915. 150 photos directly deal with flight. The photos document their successes and failures with their new flying machines. The collection provides an excellent pictorial record of the Wright Brothers' laboratory, engines, models, experimental planes, runways, flights, and even their accidents. Other photos show individual portraits and group pictures of the Wright Brothers and their family and friends, as well as photos of their homes, other buildings, towns, scenic photographs of the area around the Wright home and work camp, and visitors including Charles Lindbergh. Includes photographs taken of documents related to the defense of their father, Bishop Milton Wright. Who was wrongly accused of misappropriating church funds. Wilbur came to his defense, and his arguments before the church court were successful in exonerating his father. 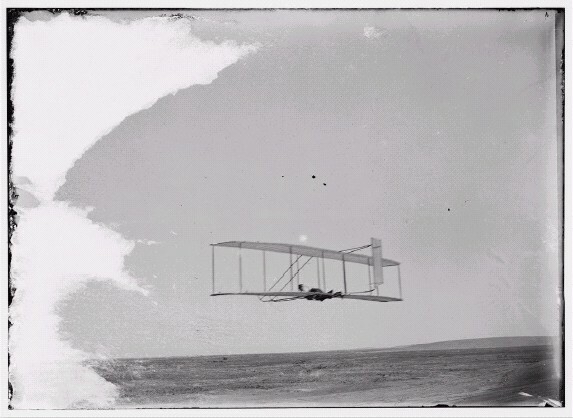 Collection includes the well known photo showing the first flight at Kitty Hawk on December 17, 1903. The brothers had arranged to have John T. Daniels of the Kill Devil Life-Saving Station, who was among the spectators, snap their camera for them just at the moment the machine had reached the end of the take-off rail and had risen two feet into the air. Before attempting the flight, Orville had placed the camera on a tripod and had aimed it at a point he hoped the machine would attain when it left the track. The shot was successful. 43 photos taken of Wright Brother's gliders in 1901 and 1902, when visiting the Wright Brothers at Kitty Hawk. Octave Chanute. Octave Chanute was a French born American civil engineer best known for the support he gave the Wright Brothers during the early years of their aviation work. n 1894, he published a group of papers that described the efforts of others to build various types of flying machines from ancient times to the present. This compendium, titled Progress in Flying Machines, was the first history of aviation. 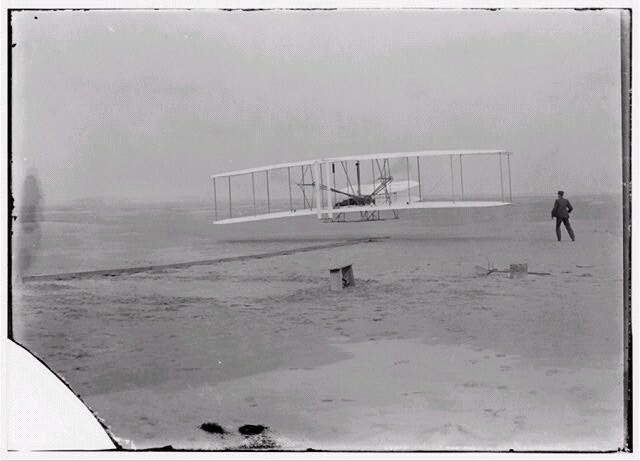 First flight, 120 feet in 12 seconds, 10:35 a.m.; Kitty Hawk, North Carolina. 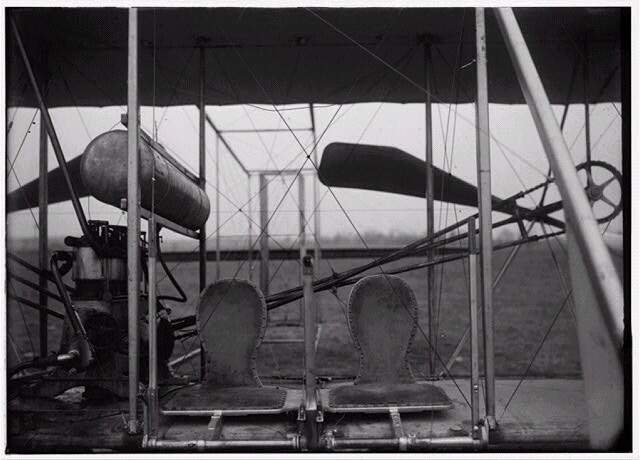 Orville Wright at the controls of the machine, lying prone on the lower wing with hips in the cradle which operated the wing-warping mechanism. Wilbur Wright running alongside to balance the machine, has just released his hold on the forward upright of the right wing. The starting rail, the wing-rest, a coil box, and other items needed for flight preparation are visible behind the machine. Wilbur gliding in level flight, single rear rudder clearly visible; Kitty Hawk, North Carolina, 1902 Oct. 17. Close-up view of airplane, including the pilot and passenger seats. 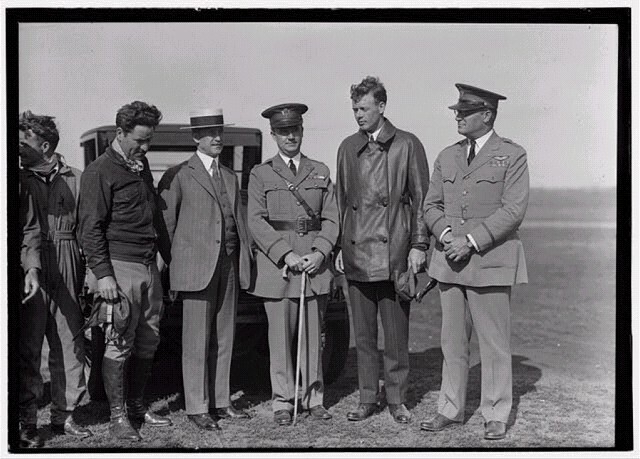 Orville Wright, Major John F. Curry, and Colonel Charles Lindbergh, who came to pay Orville a personal call at Wright Field, Dayton, Ohio.